Standing desks are gaining popularity, with many homes and offices around the world making the switch. 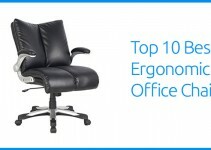 It’s no surprise why, as these desks encourage PC users to stay active and can help alleviate many conditions associated with long-term sitting, such as chronic back pain. However, while standing desks eliminate a handful of health issues, they introduce one more: leg pain. For many individuals, standing on your feet for eight or more hours a day in one location will lead to foot, leg and even stomach pain. Luckily, there is a tool the lets you get all the advantages of a standing desk without any of the disadvantages. The standing desk mat will give your feet the relief they need and let you stand for hours at a time. How Important Is the Material? The material of your standing desk mat is one of the most important choices you’ll make when picking a product. Most experts recommend a polyurethane material for your standing desk mat. 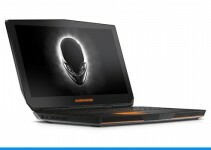 This material can last for years at a time even with prolonged use, which makes it perfect for the office or for a gamer who intends to use his standing desk for marathon gaming sessions. The only downside is that polyurethane is costly, which means the standing desk mats that use this type of material are expensive. Other materials typically used in standing desk mats include foam, rubber, gel and vinyl. Most inexpensive standing desk mats will only use one layer of any of these materials, generally falling apart after just a few months of heavy usage. However, if you only plan on using your standing desk periodically, these inexpensive desk mats will work perfectly. You’ll also want to choose a material that will compliment your choice of footwear. For example, if you’re planning on wearing high heels while using a standing desk mat, you’ll want to choose a material that can withstand the sharp points. 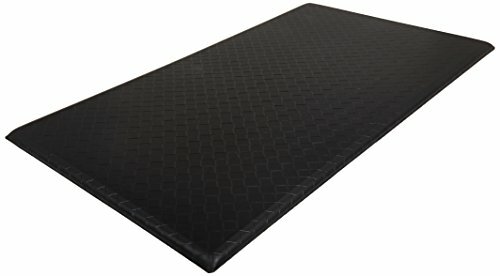 What Else Should I Look For When Buying A Standing Desk Floor Mat? There are the three other factors you should pay attention to when choosing a standing desk mat: the thickness of the mat, the warranty it comes with and how easy it is to move it. 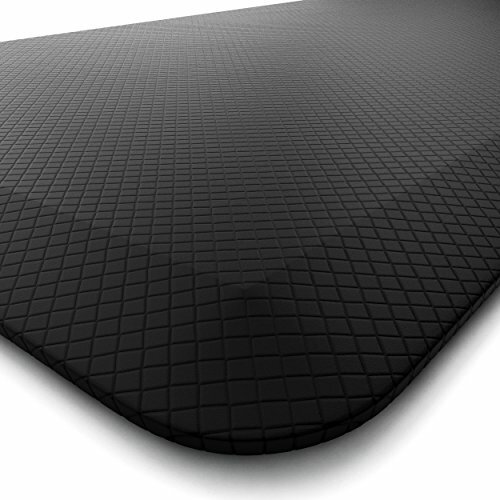 Simply put, the thicker the desk mat, the more comfort it will provide and the longer it will last. A thin standing desk mat will hardly provide you with any support and will likely shred to pieces in just a few months. Most standing desk mats come with two types of warranties: a performance warranty and a warranty against manufacturer defects. The better the performance warranty, the longer the product will typically last. 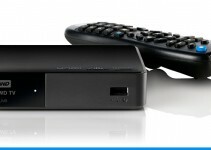 For example, you can safely assume a product with a 10-year performance warranty will last for years at a time. The warranty against manufacturer defects isn’t as important; while this warranty ranges from a few years to a lifetime, manufacturer defects typically rear their head in under a year, so a lifetime warranty isn’t essential. How easy it is to move your standing desk mat is a factor that will vary from user to user. 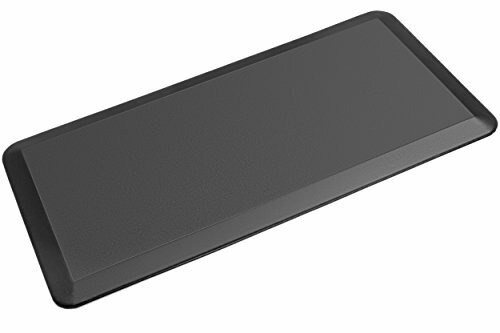 For example, some users will love the ability to reposition their desk mat by sliding it with their foot. However, some users prefer a standing desk mat that has no chance of moving from a small amount of pressure, even if it means bending down to reposition it. If you’re planning on using the mat for extended periods of time, it’s better to go with a standing desk mat that won’t easily slide around. Even when you know what to look for, the amount of standing desk mats available on the market is overwhelming. To help you choose the best standing desk mat for you, we’ve compiled a list of the 10 best standing desk mats available on the market. These standing desk mats provide support for your feet and legs at fantastic prices. Whether you use a standing desk at home or in the office, there is something for everyone on this list. The Original 3/4-Inch KANGAROO Non-Slip Anti-Fatigue Comfort Mat provides a 3/4-inch cushion of foam that will have you feeling like you’re standing on a cloud. 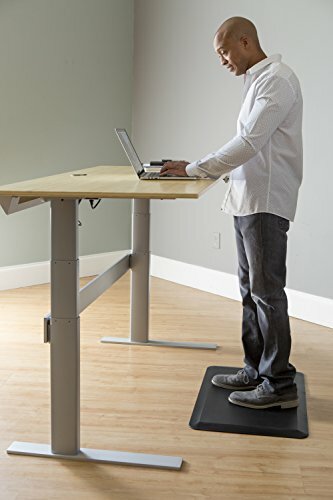 This standing desk mat removes all pressure from your soles and ankles, letting you stand at your desk for hours at a time with no discomfort. 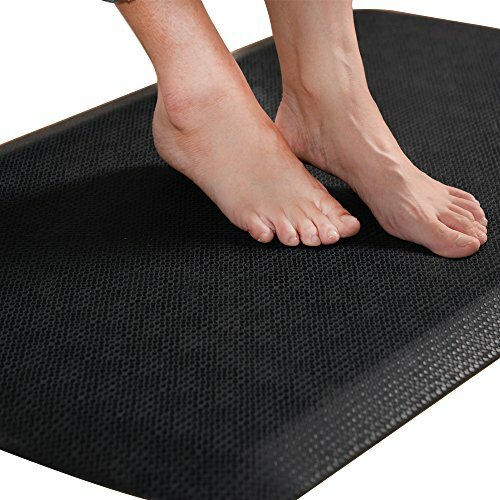 The textured surface of this standing desk mat will ensure you don’t slip off of it regardless of the type of shoes you are wearing. However, you can not use this standing desk mat with high heels or other sharp footwear. The grooved underside ensures this mat will not slip out from under you. The waterproof material protects The Original 3/4-Inch KANGAROO Non-Slip Anti-Fatigue Comfort Mat from any accidental spills. If you do happen to drop anything on this standing desk mat, just vacuum or wipe it with a damp cloth. The Sky Mat prides itself on its extreme thickness, providing a level of comfort for your feet and knees that other standing desk mats don’t provide. The creators of the Sky Mat are so confident in their product that they offer a lifetime warranty on every standing desk mat they sell. This standing desk mat isn’t just comfortable, it’s good for the environment as well; the Sky Mat uses materials that are non-toxic and don’t produce any foul odors. This standing desk mat also features a beveled edge design that keeps you from slipping off or tripping over it when walking around your office. Topo by Ergodriven is an ergonomic standing desk mat that puts an emphasis on flexibility. 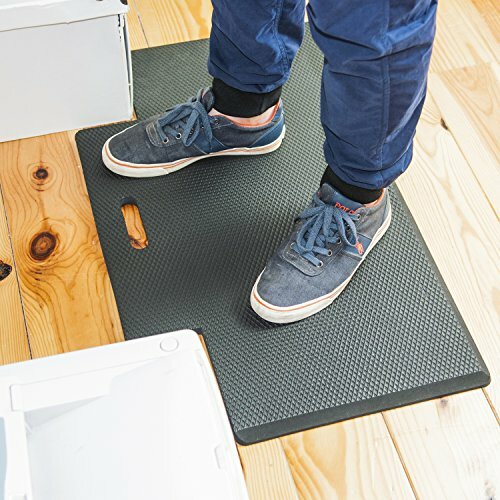 This polyurethane mat will stick solidly to any surface while you’re standing on it but also allows the user to reposition the mat with just one foot. The proprietary skin on this standing desk mat features a pebble-like texture, which Ergodriven claims will offer superior comfort for your feet and legs. This standing desk mat is available in three different colors: gray, purple and black. The NewLife standing desk mat features a beefy 5/8-inch foam core that helps support your feet, legs and back in equal measure. The beveled edges on this mat not only ensure that it won’t slip out from out under your feet but also that the mat will not curl. The NewLife standing desk mat features a stain-resistant surface, making it perfect for not only a standing desk but for kitchen use as well. The Royal Anti-Fatigue Comfort Mat is an ideal choice for standing desk owners who suffer from knee, leg and feet complications. This standing desk mat relieves up to 40 percent of the pressure in these areas, letting you stand comfortably for over eight hours at one time. The non-slip surface will ensure you won’t fall off this mat and keeps the corners from bending. The non-skid bottom will keep the mat from sliding out from under your feet. No matter what color your home or office is, you’ll find a Royal Anti-Fatigue Comfort Mat to match. This standing desk mat is available in black, brown, burgundy and beige colors. The makers of the Royal Anti-Fatigue Comfort Mat are so confident in their product that not only do they provide a lifetime warranty but also a 30-day money back guarantee as well. The AmazonBasics Premium Kitchen/Office Comfort Standing Mat is an ideal standing desk mat for infrequent standing desk users. While this standing desk mat doesn’t provide as much thickness as other mats on this list, it makes up for this with its relatively inexpensive price. 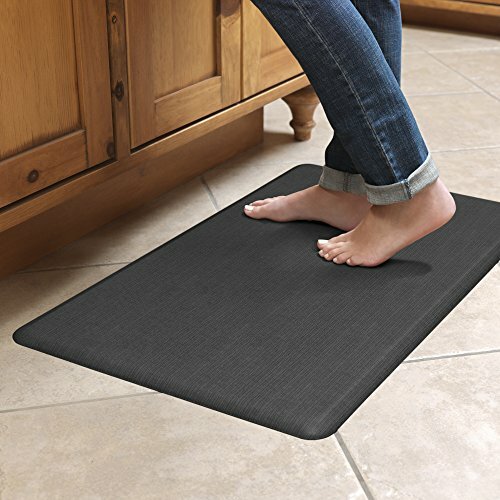 The foam cushions found in the AmazonBasics Premium Kitchen/Office Comfort Standing Mat conform to the shape of your feet while the non-slip bottom surface keeps the mat under your feet at all times. The AmazonBasics Premium Kitchen/Office Comfort Standing Mat is resistant to both spills and abrasions, meaning casual standing desk owners can enjoy it for years before needing a replacement. The HemingWeigh Non-Slip Anti-Fatigue Comfort Mat features a foam core with multiple layers that provides relief for your feet and legs. 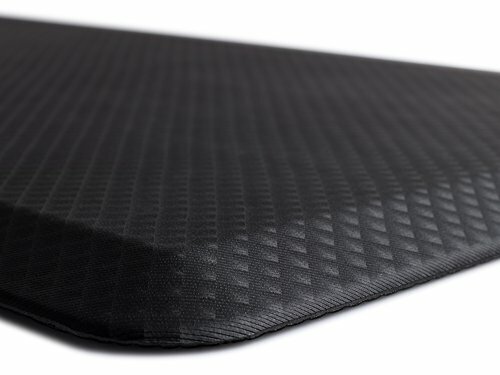 Unlike other foam mats, the material in this standing desk mat will not lose its shape or develop indentations after prolonged periods of use. For these reasons, the HemingWeigh Non-Slip Anti-Fatigue Comfort Mat is an ideal standing desk mat for an office setting where multiple people share one PC. The no-slip bottom features a unique texture to ensure it stays in one place in your home, kitchen, bathroom or even your garage. While most standing desk mats on this list are for adults, the Imprint CumulusPRO Professional Standing Desk Anti-Fatigue Mat is a standing desk mat that children can use as well. The proprietary Cushion-Core Technology within this standing desk mat is fully certified by both the National Floor Safety Institute and the American Chiropractic Association. Both agencies claim that the polyurethane material in this standing desk mat will relieve pressure on your legs, knees and feet even during prolonged use. The Imprint CumulusPRO Professional Standing Desk Anti-Fatigue Mat targets frequent PC users, as the high-density material will not lose its shape even after years of continual use. The unique shape of the Butterfly Not-Flat Standing Desk Anti-Fatigue Mat is specially designed to keep you moving in place. 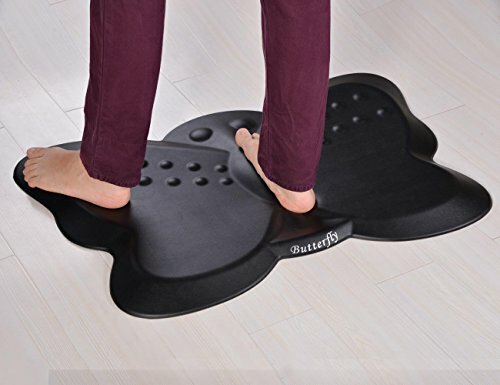 The various massage points on this standing desk mat will get the blood flowing in your feet while providing a fantastic feeling in your legs and back. 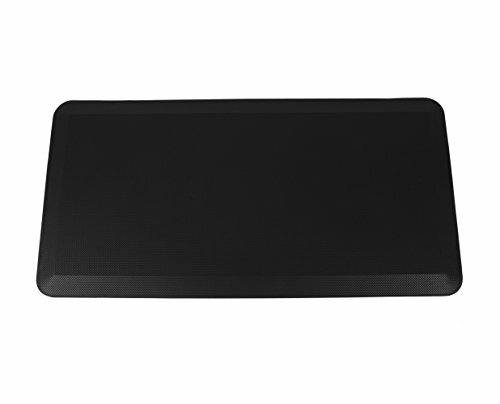 The beveled edge design prevents this standing desk mat from curling or slipping out from under your feet. The butterfly shape of this standing desk mat helps personalize your space and stands out from the rectangular shape most standing desk mats offer. The Homey Brands Anti-Fatigue Mat is a 3/4-inch standing desk mat alleviates the aches and pains of standing for extended periods of time. The grooved underside will prevent this standing desk mat from slipping on any surface, including hardwood and carpet. The smooth edges will ensure that anyone walking past this standing desk mat doesn’t trip over it by accident. The material is as good for the environment as it is for your joints thanks to the non-toxic material used in the mat’s construction. The Homey Brands Anti-Fatigue Mat is resistant to spills of all sorts, giving it an improved lifespan compared to other standing desk mats.